A striking central staircase anchors the offices, while surfaces wrap the workspace with a dramatic-yet-modern flair. Photo © Garrett Rowland, courtesy of Gensler. When your offices are also a display of your abilities in design and architecture, you’ve got to bring your A game to the project. 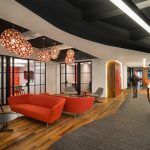 And that’s what the global architecture and design firm Gensler did when it moved and redesigned its New York offices. Spanning five floors of a Broadway address, Gensler New York glows red from the exterior and thrums with the same hot intensity inside. A striking central staircase anchors the offices, while surfaces — covered in slate bricks, warm woods, gleaming floors, and vivid pops of Gensler’s signature reds — wrap the workspace with a dramatic-yet-modern flair. In advance of their move, Gensler did an extensive study to determine the best location in the city for their clients to reach them. Ultimately, they decided that 1700 Broadway was the ideal location with easy access to the B, D, and E trains on 52nd Street, the A, B, C, D, and 1 trains at Columbus Circle, the N and R trains at 49th Street, and Citi Bikes immediately in front of the office. Every employee has an adjustable-height (sit/stand) workstation, which were designed by Knoll. Many products from a multitude of manufacturers were used to satisfy the use requirements for the various collaboration and meeting areas. Most employees are in the office all day, every day. Zero; everyone has an assigned seat. Red neon lights line the perimeter of each floor. From the street, you can see five Gensler floors glowing red. The environmental graphic design throughout the space speaks to Gensler’s culture and design philosophy. For example, there are Gensler red bricks with facts and phrases in various locations that pop on the all charcoal-colored columns. The most dramatic branded moment is a 20-foot marquee that runs through floors three through five and marries digital design with traditional signage. One side of the marquee features classic Broadway signage lighting and reads, “Boldness has genius, power & magic in it.” The other side of the marquee has an LED screen with generative design and ambient graphics that are activated by people moving throughout the space. There is a dramatic internal staircase surrounded with various collaboration and meeting spaces. The Design Center the blends the traditional library function with the firm’s technical specification team; this allows designers to access building materials, technical expertise and inspiration all at the same time. The staff welcomed the change and have settled into the space and the new neighborhood. There is a dynamic interaction created by five smaller floorplates with the stair/atrium connection. The new office is designed to provide opportunities for socialization, collaboration and innovation, while simultaneously reinforcing the Gensler culture. There is a digital people wall showcasing their amazing talent, and a digital display on the marquee that responds to movement along the stairs. 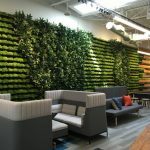 Gensler installed a grid of more than 1,000 Enlightened sensors connected to lighting and electrical outlets that track daylight levels, occupancy, temperature, and energy consumption. Through this network of sensors, Gensler aims to use their office as a lab to explore in real-time how employees work, operate and adapt their space over time. The new Gensler New York features a Model Shop that has traditional tools, as well as a few 3-D printers and a laser cutter. The space also houses a Visualization Theater that provides a more flexible, interactive space to experiment with designs for their clients using Oculus, touch screen monitors and other VR/AR tools.